At the end of my post a couple of days ago, I observed that the last two sentences of the footnote that I reproduced from Alchian’s “Information Costs, Pricing, and Resource Unemployment,” required a lot of unpacking. So let’s come back to it and try to figure out what Alchian meant. The point of the footnote was to say that Keynes’s opaque definition of involuntary unemployment rested on a distinction between the information conveyed to workers by an increase in the price level, their money wage held constant, and the information conveyed to them by a reduction in their money wage, with the price level held constant. An increase in the price level with constant money wages conveys no information to workers about any change in their alternatives. Employed workers are not induced by an increase in prices to quit their current jobs in the expectation of finding higher paying jobs, and unemployed workers are not induced to refuse an offer from a prospective employer, as they would be if the employer cut the money wages at which he was willing pay his current employees or to hire new ones. That subtle difference in the information conveyed by a cut in real wages effected by rising prices versus the information conveyed by a cut in real wages effected by a cut in money wages, Alchian explained, is the reason that Keynes made his definition of involuntary unemployment contingent on the differing responses of workers to a reduced real wage resulting from a rising price level and from a falling money wage. Here is where the plot thickens, because Alchian adds the following comment. And this is perfectly consistent with Keynes’s definition of [involuntary] unemployment, and it is also consistent with his entire theory of market adjustment processes . . . , since he believed wages lagged behind nonwage prices – an unproved and probably false belief (R. A. Kessel and A. A. Alchian, “The Meaning and Validity of the Inflation-Induced Lag of Wages Behind Prices,” Amer. Econ. Rev. 50 [March 1960]:43-66). Without this belief a general price-level rise is indeed general; it includes wages, and as such there is no reason to believe a price-level rise is equivalent in real terms to a money-wage cut in a particular job. So, according to Alchian, Keynes’s assumption that the information extracted by workers from a price-level increase is not the same as the information extracted from a nominal wage cut depends on the existence of a lag in the adjustment of wages to an inflationary disturbance. Keynes believed that during periods of inflation, output prices rise before, and rise faster than, wages rise, at least in the early stages of inflation. But if prices and wages rise simultaneously and at the same rate during inflation, then there would be no basis for workers to draw different inferences about their employment opportunities from observing price increases as opposed to observing a nominal wage cut. Alchian believes that the assumption that there is a wage-lag during inflation is both theoretically problematic, and empirically suspect, relying on several important papers that he co-authored with Reuben Kessel that found little support for the existence of such a lag in the historical data on wages and prices. I have two problems with Alchian’s caveat about the existence of a wage-price lag. First, Alchian’s premise (with which I agree totally) in the article from which I am quoting is that lack of information about the characteristics of goods being sold and about the characteristics of sellers or buyers (when the transaction involves a continuing relationship between the transactors) and about the prices and characteristics of alternatives induces costly search activities, the holding of inventories, and even rationing or queuing, as alternatives to immediate price adjustments as a response to fluctuations in demand or supply. The speed of price adjustment is thus an economically determined phenomenon, the speed depending on, among other things, the particular characteristics of the good or service being sold and the ease of collecting information about the good and service. For example, highly standardized commodities about which information is readily available tend to have more rapidly adjusting prices than those of idiosyncratic goods and services requiring intensive information gathering by transactors before they can come to terms on a transaction. If employment transactions typically involve a more intensive information gathering process about the characteristics of workers and employers than most other goods and services, then Alchian’s own argument suggests that there should be a lag in wage adjustment relative to the prices of most other goods. An inflation, on Alchian’s reasoning, ought to induce an initial response in the prices of the more standardized commodities with price adjustments in less standardized, more informationally complex, markets, like labor markets, coming later. So I don’t understand Alchian’s theoretical basis for questioning the existence of a wage lag. Second, my memory is a bit hazy, and I will need to check his article on the wage lag, but I do believe that Alchian pointed out that there is a problem of interpretation in evaluating evidence on the wage lag, because inflation may occur concurrently, but independently, with another change that reduces the demand for labor and causes the real wage to fall. So if one starts, as did Keynes in his discussion of involuntary unemployment, from the premise that a recession is associated with a fall in the real demand for labor that requires a reduction in the real wage to restore full employment, then it is not clear to me why it would be rational for a worker to increase his reservation wage immediately upon observing that output prices are increasing. Workers will typically have some expectation about how rapidly the wage at which they can find employment will rise; this expectation is clearly related to their expectation of how fast prices will rise. If workers observe that prices are rising faster than they expected prices to rise, while their wage is not rising any faster than expected, there is uncertainty about whether their wage opportunities in general have fallen or whether the wage from their current employer has fallen relative to other opportunities. Saturos, in a comment on Tuesday’s post, argued that the two scenarios are indeed symmetrical and that to suggest otherwise is indeed an instance of money illusion. The argument is well taken, but I think that at least in transitional situations (when it seems to me theory supports the existence of a wage lag) and in which workers have some evidence of deteriorating macroeconomic conditions, there is a basis, independent of money illusion, for the Keynesian distinction about the informational content of a real wage cut resulting from a price level increase versus a real wage cut resulting from a cut in money wages. But I am not sure that this is the last word on the subject. In my previous post, I reproduced a footnote from Armen Alchian’s classic article “Information Costs, Pricing and Resource Unemployment,” a footnote explaining the theoretical basis for Keynes’s somewhat tortured definition of involuntary unemployment. In this post, I offer another excerpt from Alchian’s article, elaborating on the microeconomic rationale for “slow” adjustments in wages. In an upcoming post, I will try to tie some threads together and discuss the issue of whether there might be, contrary to Alchian’s belief, a theoretical basis for wages to lag behind other prices, ata least during the initial stages of inflation. Herewith are the first four paragraphs of section II (Labor Markets) of Alchian’s paper. Though most analyses of unemployment rely on wage conventions, restriction, and controls to retard wage adjustments above market-clearing levels, [J. R.] Hicks and [W. H.] Hutt penetrated deeper. Hicks suggested a solution consistent with conventional exchange theory. He stated that “knowledge of opportunities is imperfect” and that the time required to obtain that knowledge leads to unemployment and a delayed effect on wages. [fn. J. R. Hicks, The Theory of Wages, 2d ed. (London, 1963), 45, 58. And headed another type – “the unemployment of the man who gives up his job to look for a better.”] It is precisely this enhanced significance that this paper seeks to develop, and which Hicks ignored when he immediately turned to different factors – unions and wage regulations, placing major blame on both for England’s heavy unemployment in the 1920s and 30s. We digress to note that Keynes, in using a quantity-, instead of a price-, adjustment theory of exchange, merely postulated a “slow” reacting price without showing that slow price responses were consistent with utility or wealth-maximizing behavior in open, unconstrained markets. Keynes’s analysis was altered in the subsequent income-expenditure models where reliance was placed on “conventional” or “noncompetitive” wage rates. Modern “income-expenditure” theorists assumed “institutionally” or “irrationally” inflexible wages resulting from unions, money illusions, regulations, or factors allegedly idiosyncratic to labor. Keynes did not assume inflexibility for only wages. His theory rested on a more general scope of price inflexibility. [fn. For a thorough exposition and justification of these remarks on Keynes, see A. Leijonhufvud, On Keynesian Economics and the Economics of Keynes (Oxford, 1968).] The present paper may in part be viewed as an attempt to “justify” Keynes’s presumption about price response to disturbances in demand. In 1939 W. H. Hutt exposed many of the fallacious interpretations of idleness and unemployment. Hutt applied the analysis suggested by Hicks but later ignored it when discussing Keynes’s analysis of involuntary unemployment and policies to alleviate it. [fn. W. H. Hutt, The Theory of Idle Resources (London, 1939), 165-69.] This is unfortunate, because Hutt’s analysis seems to be capable of explaining and accounting for a substantial portion of that unemployment. If we follow the lead of Hicks and Hutt and develop the implications of “frictional” unemployment for both human and nonhuman goods, we can perceive conditions that will imply massive “frictional” unemployment and depressions in open, unrestricted, competitive markets with rational, utility maximizing, individual behavior. So Alchian is telling us that it is at least possible to conceive of conditions in which massive unemployment and depressions are consistent with “open, unrestricted, competitive markets with rational, utility maximizing, individual behavior.” And presumably would be more going on in such periods of massive unemployment than the efficient substitution of leisure for work in periods of relatively low marginal labor productivity. In his classic paper “Information Costs, Pricing, and Resource Unemployment,” Armen Alchian explains how the absence of full information about the characteristics of goods and services, and about the prices at which they are available leads to a variety of phenomena that are inconsistent with implications of idealized “perfect markets” at which all transactors can buy or sell as much as they want to at known, market-clearing, prices. The main implications of less than full information are the necessity of search, less than instantaneous price adjustment to changes in demand or cost conditions, the holding of (seemingly) idle or unemployed inventories, queuing, and even rationing. The paper was originally published in 1969 in the Western Economic Journal (subsequently Economic Inquiry) and was republished in a 1970 volume edited by Edmund Phelps, Microeconomic Foundations of Employment and Inflation Theory. It is included in The Collected Works of Armen Alchian (volume 1) published by the Liberty Fund. Men are involuntary unemployed if, in the event of a small rise in the price of wage-goods relative to the money-wage, both the aggregate supply of labour willing to work for the current money wage and the aggregate demand for it at that wage would be greater than the existing volume of employment. [J. M. Keynes, The General Theory of Employment, Interest, and Money (The Macmillan Company, London, 1936).] To see the power and meaning of this definition (not cause) of unemployment, consider the following question: Why would a cut in money wages provoke a different response than if the price level rose relative to wages – when both would amount to the same change in relative prices, but differ only in the money price level? Almost everyone thought Keynes presumed a money wage illusion. However, an answer more respectful of Keynes is available. The price level rise conveys different information: Money wages everywhere have fallen relative to prices. On the other hand, a cut in one’s own wage money wage does not imply options elsewhere have fallen. A cut only in one’s present job is revealed. The money versus real wage distinction is not the relevant comparison; the wage in the present job versus the wage in all other jobs is the relevant comparison. This rationalizes Keynes’ definition of involuntary unemployment in terms of price-level changes. If wages were cut everywhere else, and if employees knew it, they would not choose unemployment – but they would if they believed wages were cut just in their current job. When one employer cuts wages, this does not signify cuts elsewhere. His employees rightly think wages are not reduced elsewhere. On the other hand, with a rise in the price level, employees have less reason to think their current real wages are lower than they are elsewhere. So they do not immediately refuse a lower real wage induced by a higher price level, whereas they would refuse an equal money wage cut in their present job. It is the revelation of information about prospects elsewhere that makes the difference. And this is perfectly consistent with Keynes’ definition of [involuntary] unemployment, and it is also consistent with his entire theory of market-adjustment processes (Keynes, The General Theory of Employment, Interest, and Money) since he believed that money wages lagged behind nonwage prices – an unproved and probably false belief (R. A. Kessel and A. A. Alchian, “The Meaning and Validity of the Inflation-Induced Lag of Wages Behind Prices,” American Economic Review 50 (March 1960): 43-66). Without that belief a general price-level rise is indeed general; it includes wages, and as such there is no reason to believe a price level rise is equivalent in real terms to a money wage cut in a particular job. PS There is a lot of unpacking that needs to be done in the last two sentences, but that is best left for another post. How Did We Get into a 2-Percent Inflation Trap? It is now over 50 years since Paul Samuelson and Robert Solow published their famous paper “Analytical Aspects of Anti-Inflation Policy,” now remembered mainly for offering the Phillips Curve as a menu of possible combinations of unemployment and inflation, reflecting a trade-off between inflation and unemployment. By accepting a bit more inflation, policy-makers could bring down the rate of unemployment, vice-versa. This view of the world enjoyed a brief heyday in the early 1960s, but, thanks to a succession of bad, and sometimes disastrous, policy choices, and more than a little bad luck, we seemed, by the late 1970s and early 1980s, to be stuck with the worst of both worlds: high inflation and high unemployment. In the meantime, Milton Friedman (and less famously Edmund Phelps) countered Samuelson and Solow with a reinterpretation of the Phillips Curve in which the trade-off between inflation and unemployment was only temporary, inflation bringing down unemployment only when it is unexpected. But once people begin to expect inflation, it is incorporated into wage demands, so that the stimulative effect of inflation wears off, unemployment reverting back to its “natural” level, determined by “real” forces. Except in the short run, monetary policy is useless as a means of reducing unemployment. That theoretical argument, combined with the unpleasant experience of the 1970s and early 1980s, combined with a fairly rapid fall in unemployment after inflation was reduced from 12 to 4% in the 1982 recession, created an enduring consensus that inflation is a bad thing and should not be resorted to as a method of reducing unemployment. I generally accept the Friedman/Phelps argument (actually widely anticipated by others, including, among others, Mises, Hayek and Hawtrey, before it was made by Friedman and Phelps) though it is subject to many qualifying conditions, for example, workers acquire skills by working, so a temporary increase in employment can have residual positive effects by increasing the skill sets and employability of the work force, so that part of the increase in employment resulting from inflation may turn out to be permanent even after inflation is fully anticipated. But even if one accepts Friedman’s natural-rate hypothesis in its most categorical form, the Friedman argument does not imply that inflation is never an appropriate counter-cyclical tool. Indeed, the logic of Friedman’s argument, properly understood and applied, implies that inflation ought to be increased when the actual rate of unemployment exceeds the natural rate of unemployment. But first let’s understand why Friedman’s argument implies that it is a bad bargain to reduce the unemployment rate temporarily by raising the rate of inflation. After all, one could ask, why not pocket a temporary increase in output and employment and accept a permanently higher rate of inflation? The cost of the higher rate of inflation is not zero, but it is not necessarily greater than the increased output and employment achieved in the transition. To this there could be two responses, one is that inflation produces distortions of its own that are not sustainable, so that once the inflation is expected, output and employment will not remain at old natural level, but will, at least temporarily, fall below the original level, so the increase in output and employment will be offset by a future decrease in output and employment. This is, in a very general sense, an Austrian type of argument about the distorting effects of inflation requiring some sort of correction before the economy can revert back to its equilibrium path even at a new higher rate of inflation, though it doesn’t have to be formulated in the familiar terms of Austrian business cycle theory. But that is not the argument against inflation that Friedman made. His argument against inflation was that using inflation to increase output and employment does not really generate an increase in output, income and employment properly measured. The measured increase in output and employment is achieved only because individuals and businesses are misled into increasing output and employment by mistakenly accepting job offers at nominal wages that they would not have accepted had they realized that pries and general would be rising. Had they correctly foreseen the increase in prices and wages, workers would not have accepted job offers as quickly as they did, and if they had searched longer, they would have found that even better job offers were available. More workers are employed, but the increase in employment comes at the expense of mismatches between workers and the jobs that they have accepted. Since the apparent increase in output is illusory, there is little or no benefit from inflation to outweigh the costs of inflation. The implied policy prescription is therefore not to resort to inflation in the first place. Even if we accept it as valid, this argument works only when the economy is starting from a position of full employment. But if output and employment are below their natural or potential levels, the argument doesn’t work. The reason the argument doesn’t work is that when an economy starts from a position of less than full employment, increases in output and employment are self-reinforcing and cumulative. There is a multiplier effect, because as the great Cambridge economist, Frederick Lavington put it so well, “the inactivity of all is the cause of the inactivity of each.” Thus, the social gain to increasing employment is greater than the private gain, so in a situation of less-than-full employment, tricking workers to accept employment turns out to be socially desirable, because by becoming employed they increase the prospects for others to become employed. When the rate of unemployment is above the natural level, a short-run increase in inflation generates an increase in output and employment that is permanent, and therefore greater than the cost associated with a temporary increase in inflation. As the unemployment rate drops toward the natural level, the optimal level of inflation drops, so there is no reason why the public should anticipate a permanent increase in the rate of inflation. When actual unemployment exceeds the natural rate, inflation, under a strict Friedmanian analysis, clearly pays its own way. But we are now trapped in a monetary regime in which even a temporary increase in inflation above 2-percent apparently will not be tolerated even though it means perpetuating an unemployment rate of 8 percent that not so long ago would have been considered intolerable. What is utterly amazing is that the intellectual foundation for our new 2-percent-inflation-targeting regime is Friedman’s natural-rate hypothesis, and a straightforward application of Friedman’s hypothesis implies that the inflation rate should be increased whenever the actual unemployment rate exceeds the natural rate. What a holy mess. These are exciting times. Europe is in disarray, unable to cope with a crisis requiring adjustments in relative prices, wages, and incomes that have been rendered impossible by a monetary policy that has produced almost no growth in nominal GDP in the Eurozone since 2008, placing an intolerable burden on the Eurozone’s weakest economies. The required monetary easing by the European Central Bank is unacceptable to Germany, so the process of disintegration continues. The US, showing signs of gradual recovery in the winter and early spring, remains too anemic to shake off the depressing effects of the worsening situation in Europe. With US fiscal policy effectively stalemated until after the election, the only policy-making institution still in play is the Federal Open Market Committee (FOMC) of the Federal Reserve. The recent track record of the FOMC can hardly inspire much confidence in its judgment, but it’s all we’ve got. Yesterday’s stock market rally shows that the markets, despite many earlier disappointments, have still not given up on the FOMC. But how many more disappointments can they withstand? In today’s Financial Times, Peter Fisher (head of fixed income at BlackRock) makes the case (“Fed would risk diminishing returns with further ‘QE'”) against a change in policy by the Fed. Fisher lists four possible policy rationales for further easing of monetary policy by the Fed: 1) the “bank liquidity” rationale, 2) the “asset price” rationale, 3) the “credit channel” rationale, and 4) the “radical monetarist” rationale. Fisher dismisses 1), because banks are awash in excess reserves from previous bouts of monetary easing. I agree, and that’s why the Fed should stop paying banks interest on reserves. He dismisses 2) because earlier bouts of monetary easing raised asset prices but had only very limited success in stimulating increased output. While [the Fed] did drive asset prices higher for a few months, there was little follow-through in economic activity in 2011. This approach provides little more than a bridging operation and the question remains: a bridge to what? This is not a persuasive critique. Increased asset prices reflected a partial recovery in expectations of future growth in income and earnings. A credible monetary policy with a clearly articulated price level of NGDP target would have supported expectations of higher growth than the anemic growth since 2009, in which asset prices would have risen correspondingly higher, above the levels in 2007, which we have still not reached again. Fisher rejects 3), the idea “that if the Fed holds down long-term interest rates it will stimulate private credit creation and, thus, economic expansion.” Implementing this idea, via “operation twist” implies taking short-term Treasuries out of the market and replacing them with longer-term Treasuries, but doing so denies “banks the core asset on which they build their balance sheets,” thus impairing the provision of credit by the banking system instead of promoting it. What assets would the Fed buy? More Treasuries? Would the Fed embark on such a radical course in a presidential election year? Perhaps the Fed could buy foreign currencies, engineer a much weaker dollar and, thereby, stimulate inflation and growth. Would the rest of the world permit this? I doubt it. They would probably respond in kind and we would all have a real currency war. Nor is it clear the US external sector is large enough to import enough inflation to make a difference. If energy and commodity prices soared, would American consumers “chase” consumption opportunities or would they suppress consumption and trigger a recession? Recent experience suggests the latter. How much “chasing behaviour” would we get in a recession? Engineering a dollar collapse would be to play with fire and gasoline. It might create inflation or it might create a depression. These are concerns that have been expressed before, especially in astute and challenging comments by David Pearson to many of my posts on this blog. They are not entirely misplaced, but I don’t think that they are weighty enough to undermine the case for monetary easing, especially monetary easing tied to an explicit price level or NGDP target. As I pointed out in a previous post, Ralph Hawtrey addressed the currency-war argument 80 years ago in the middle of the Great Depression, and demolished it. FDR’s 40-percent devaluation of the dollar in 1933, triggering the fastest four-month expansion in US history, prematurely aborted by the self-inflicted wound of the National Recovery Administration, provides definitive empirical evidence against the currency-war objection. As for the fear that monetary easing and currency depreciation would lead to an upward spiral of energy and commodity prices that would cause a retrenchment of consumer spending, thereby triggering a relapse into recession, that is certainly a risk. But if you believe that we are in a recession with output and employment below the potential output and employment that the economy could support, you would have to be awfully confident that that scenario is the most likely result of monetary easing in order not to try it. The point of tying monetary expansion to an explicit price level or spending target is precisely to provide a nominal anchor for expectations. That nominal anchor would provide a barrier against the kind of runaway increase in energy and commodity prices that would supposedly follow from a commitment to use monetary policy to achieve a price-level or spending target. Hawtrey’s immortal line about crying “fire, fire” in Noah’s flood is still all too apt. It was three and a half weeks ago (May 14) that I wrote a post “Inflation Expectations Are Falling; Run for Cover” in which I called attention to the fact that inflation expectations, which had been rising since early in 2012, had begun to fall, and that the shift had coincided with falling stock prices. I included in that post the chart below showing the close correlation between inflation expectations (approximated by the breakeven TIPS spread on 10-year constant-maturity Treasuries and 10-year constant-maturity TIPS) . Then I noted in two posts (May 24 and May 30) that since early in May, I had detected an anomaly in the usual close correlation between short-term and long-term real interest rates, longer-term real interest rates having fallen more sharply than shorter-term real interest rates since the start of May. That was shown in the chart below. I thought it would now be useful to look at my chart from May 14 with the additional observations from the past three weeks included. The new version of the May 14 chart is shown below. What does it teach us? There still seems to be a correlation between inflation expectations and stock prices, but it is not as close as it was until three weeks ago. 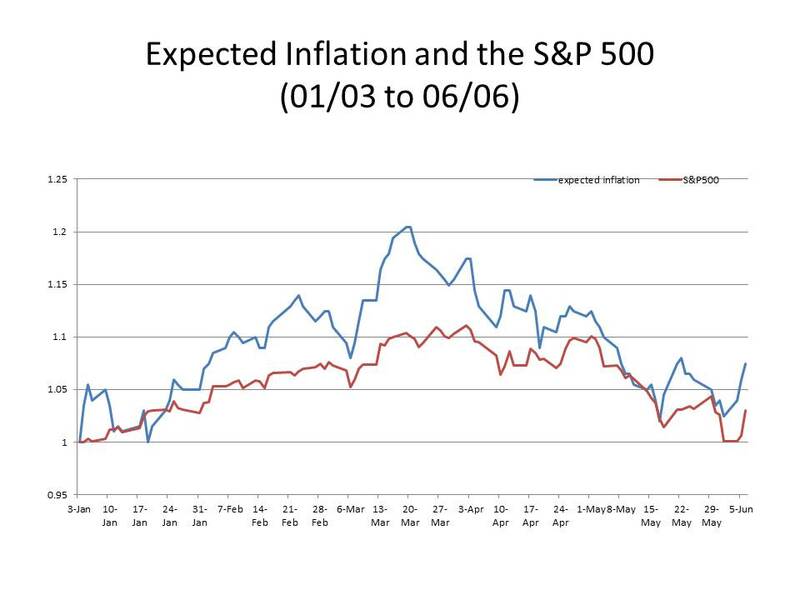 I confirmed this by computing the correlation coefficient between inflation expectations and the S&P 500 from January 3 to May 14. The correlation was .9. Since May 14, the correlation is only .4. 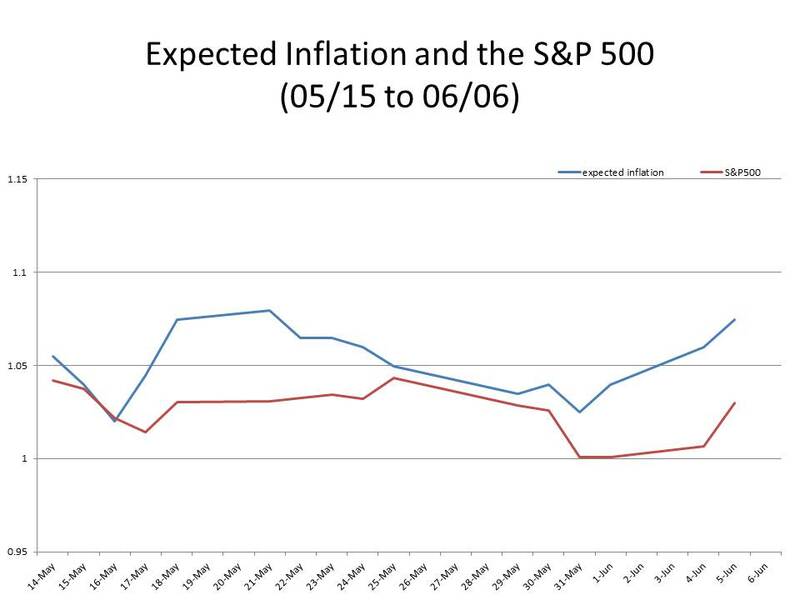 That is a relatively weak correlation, but one should note that there are other three-week periods between January 3 and May 14 in which the correlation between inflation expectations and stock prices is even lower than .4. Still, one can’t exclude the possibility that the last three weeks involve some change in circumstances that has altered the relationship between inflation expectations and stock prices. 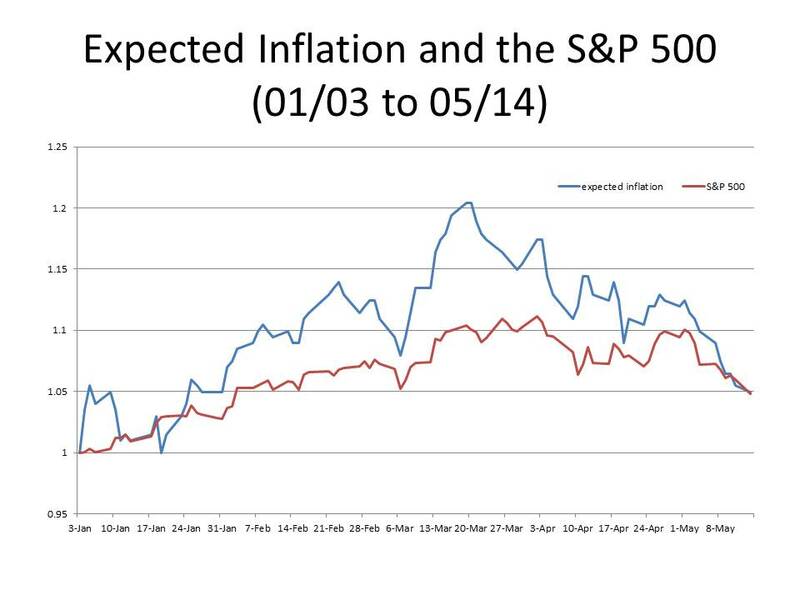 The chart below plots the movement in inflation expectations and stock prices for just the last three weeks. One other point bears mentioning: the sharp increase in stock prices yesterday was accompanied by increases in nominal and real interest rates, for all durations. That is not an anomalous result; it has been the typical relationship since the early stages of the Little Depression. Expected inflation implies increased nominal rates and increased borrowing costs. Moreover, expected inflation has generally been positively correlated with real interest rates, expectations of increased inflation being correlated with expectation of increased real returns on investment. So the conventional textbook theory that loose monetary policy increases stock prices and economic activity by reducing borrowing costs is simply not reflected in the data since the start of the Little Depression. Do I See a Patch of Blue? It’s June, and I’m in Washington DC; the sky is blue, and the temperature outside is in the low 70s. Oh, and stock markets around the world are soaring. This is as good as it gets. With Europe on the brink of the abyss, and all the gloom and doom of the past month, is there really cause for optimism? I don’t know, but Scott Sumner got all excited yesterday about signs that people are finally starting to get it, especially this piece by Matthew O’Brien posted on the Atlantic website. Optimism seems to be catching, at least on the stock market. There does seem to be a growing understanding that the conventional way of thinking about how monetary policy works – increasing the quantity of money causes interest rates to fall, inducing increased spending by business and households – is misleading, especially when interest rates are already close to zero. Instead, the way to think about the money supply is that the monetary authority ties its creation of money to a price or spending target. But for monetary policy to work in this way, the monetary authority has to announce, or at least make clear, that its policy is subordinate to the target it is aiming at, so that the public can revise its expectations accordingly. When the public’s expectations change in the appropriate direction, the battle is more than half won; the rest is a mopping up operation. Also worthy of mention (a huge understatement BTW) are three recent posts by the precocious Evan Soltas (on monetary policy in Switzerland here and here and on monetary policy in Israel) which beautifully illustrate points that Scott and others have been making with little effect (on policy) since 2009. The voices crying out for a different approach to monetary policy are no longer lonely, and no longer in the wilderness. (And while handing out plaudits, I’ll just mention my own post about Switzerland back in September). U.S. stocks were soaring Wednesday morning as investors rushed in from the sidelines on hopes the Federal Reserve could soon signal it’s open to additional stimulus measures. The Dow Jones Industrial Average was rising 178 points, or 1.5%, at 12,306. The move puts the blue-chip index back in positive territory for the year. The S&P 500 was up 20 points, or 1.6%, at 1305. The Nasdaq was surging 50 points, or 1.8%, at 2828. All 30 Dow components were in positive territory, with Bank of America(BAC_), JPMorgan Chase(JPM_) and Hewlett-Packard(HPQ_) leading the gains. Within the S&P 500, 95% of components were on the rise. Gainers were outpacing decliners by a 7-to-1 ratio on the New York Stock Exchange and 4-to-1 on the Nasdaq. The leading sectors were basic materials, capital goods and energy. The European Central Bank said Wednesday that it was keeping its benchmark interest rate at 1%. However, the markets continued to look for clues that the central bank would show an openness to lowering rates by July in the face of growing signs of recession on the continent and Spain’s troubled banking system. “There is a necessity for them to show their cards when conditions turn urgent,” said Geoffrey Yu, analyst at UBS. After the meeting, ECB President Mario Draghi indicated that short-term liquidity measures would continue but withheld clues on more aggressive plans to tackle the debt crisis. “Today, we have decided to continue conducting our main refinancing operations as fixed rate tender procedures with full allotment for as long as necessary, and at least until … January,” Draghi said at a press briefing. Federal Reserve Chairman Ben Bernanke testifies before Congress on Thursday, and it will be his first opportunity to comment on the weak jobs report last Friday. Given that the benchmark interest rate in the U.S. is already at a record low, the market will look for clues that the central bank could embark on a third round of quantitative easing. The FTSE in London was rising 1.9% and the DAX in Germany was gaining 1.6%. Maybe things really are darkest just before the dawn. We may be in for a long hot summer in Washington, but today I will enjoy the good weather and blue sky while it lasts. I sure hope Bernanke doesn’t spoil it all tomorrow. Why Not Arbitrage TIPS and Treasuries? Larry Summers has a really interesting piece in today’s Financial Times (“Look beyond interest rates to get out of the gloom”), advocating that safe-haven governments (like the US, Germany and the UK) which are now able to borrow at close to zero rates of interest, which adjusted for expected inflation, amount to negative rates. Given such low borrowing costs, Summers argues, governments should be borrowing like crazy to finance any investment that promises even a marginally positive real return, even apart from Keynesian stimulative effects. This is not a new idea, countercyclical public works spending has often been advocated even by orthodox anti-Keynesians as nothing more than sensible budgetary policy, borrowing when the cost of borrowing is cheap and hiring factors of production in excess supply at discounted prices, to finance long-term investment projects. If there is a Keynesian effect on top of that, so much the better, but the rationale for doing so doesn’t depend on the existence of a positive multiplier effect. But Summers’s argument takes this argument a step further, because as he presents it, the case for doing so is almost akin to engaging in an arbitrage transaction. As my fellow Harvard economist Martin Feldstein has pointed out, this principle applies to accelerating replacement cycles for military supplies. Similarly, government decisions to issue debt and then buy space that is currently being leased will improve the government’s financial position. That is, as long as the interest rate on debt is less than the ratio of rents to building values, a condition almost certain to be met in a world of government borrowing rates of less than 2 per cent. These examples are the place to begin because they involve what is in effect an arbitrage, whereby the government uses its credit to deliver essentially the same bundle of services at a lower cost. It would be amazing if there were not many public investment projects with certain equivalent real returns well above zero. Consider a $1 project that yielded even a permanent 4 cents a year in real terms increment to GDP by expanding the economy’s capacity or its ability to innovate. Depending on where it was undertaken, this project would yield at least 1 cent a year in government revenue. At any real interest rate below 1 per cent, the project pays for itself even before taking into account any Keynesian effects. Now one blogger (Tea With FT) commenting on Summers’s piece found grounds to quibble about whether the rates governments pay on their debt are “free market rates,” because banking regulations allow banks to reduce their capital requirements by holding government debt but must increase their capital requirements as they increase their holdings of private debt. Lawrence Summers is just another economist fooled by looking only at the nominal low interest rates for government debt of some “infallible” sovereigns, “Look beyond the interest rates to get out of the gloom“. Those interest rates do not reflect real free market rates, but the rates after the subsidies given to much government borrowing implicit in requiring the banks to have much less capital for that than for other type of lending. If the capital requirements for banks when lending to a small business or an entrepreneurs was the same as when lending to the government… then we could talk about market rates. As is, to the cost of government debt, we need to add all the opportunity cost of all bank lending that does not occur because of the subsidy… and those could be immense. I’m not going to get in that discussion here, but the point seems well-taken. But leaving that aside, I want to ask the following question: As long as the interest rate on TIPS is negative, why is the US government not selling massive amount of TIPS, using the proceeds to retire conventional Treasuries while earning a profit on each exchange of a TIPS for a Treasury? That would be true arbitrage whatever the merits of Tea With FT’s argument. Are there statutory limits on the amount of TIPS that can be sold? The issue also seems to bear on the discussion that Steve Williamson and Miles Kimball have been having (here, here, and here, and also see Noah Smith’s take) about whether the Modigliani-Miller theorem applies to the Fed’s balance sheet. If there are arbitrage profits available exchanging conventional Treasuries for TIPS, what does that say about whether the Modigliani-Miller theorem holds for the Fed? My next question is: if there are arbitrage profits to be made from such an exchange of assets, what is the mechanism by which the arbitrage profits would be eliminated? Why would exchanging Treasuries for TIPS alter real interest rates or inflation expectations in such a way as to eliminate the discrepancy in yields? Maybe there is something obvious going on that I’m not getting. What is it? And if the reason is not obvious, I’ld like to know it, too. UPDATE: Thanks to Cantillonblog and Foosion for explaining the obvious to me. In my haste, I wasn’t thinking clearly. 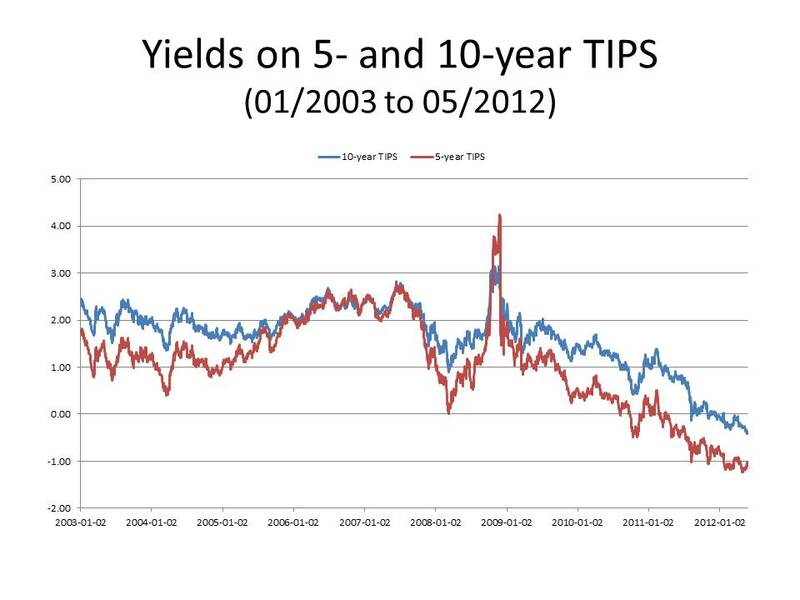 Given the expectation of inflation, the negative yield on TIPS will have to be supplemented by a further payment to compensate for the loss of principle due to inflation, so the cash flows associated with either a conventional Treasury or a TIPS are equal if inflation matches the implicit expectation of inflation corresponding to the TIPS spread. But suppose the Treasury did issue more TIPS relative to conventional Treasuries, wouldn’t the additional Treasuries be sold to people who had slightly higher expectations of inflation than those who were already holding them? Or alternatively, wouldn’t the very fact that the government was trying to sell more TIPS and fewer conventional Treasuries cause the public to revise their expectations of inflation upwards? That’s not exactly the conventional channel by which either monetary policy or fiscal policy affects inflation expectations, but it does suggest that the policy authorities have some traction in trying to affect inflation expectations. In addition, since interest rates fell close to zero after the financial panic of 2008, inflation expectations have responded in the expected direction to changes in the stance of monetary policy, rising after the announcment of QE1 and QE2 and falling when they were terminated. UPDATE 2: I am posting too fast today. If the Treasury increased the quantity of TIPS being offered, it would drive down the price of the TIPS, increasing the real inflation adjusted yield. An increased real yield, at a given nominal rate, would imply a reduced break even TIPS spread, or reduced inflation expectations. Thus, increasing the proportion of TIPS relative to conventional Treasuries would induce savers with relatively lower inflation expectations than those previously holding them to begin holding them as well. Alternatively, increasing the proportion of TIPS outstanding would encourage individuals to revise their expectations of inflation downward because the Treasury would be increasing its exposure to inflation. But the point about the applicability of the MM theorem still applies with the appropriate adjustments. At least until further notice. Since Friday’s post about John Taylor’s misunderstanding of Hayek, I watched the 57-minute video of John Taylor’s Hayek Prize Lecture. I will not offer an extended critique of the lecture, which was little more than a collection of talking points based on little empirical evidence and no serious analysis or argument. If that description sounds like a critique, so be it, but the lecture was more in the way of a ritual invocation of shared beliefs and values than an attempt to make a substantive case for a definite policy or set of policies. Whether those present at the lecture were appropriately reinforced in their shared beliefs by Taylor’s low-key remarks and placid delivery, I have no idea, but he obviously was not trying to break any new intellectual ground. Though I found Taylor’s remarks generally boring, I did perk up about 33-34 minutes through the lecture when Taylor observed that Hayek had himself, on occasion, deviated from his own principles. How does Taylor know this? He knows this (or thinks he does, at any rate), because, as a fellow of the Hoover Institution at Stanford University, he has access to Hayek’s correspondence, which contains Keynes’s famous letter to Hayek praising The Road to Serfdom, a letter Taylor quotes from just before he gets to his point about Hayek’s “deviation,” and access to a letter that Milton Friedman wrote to Hayek complaining about Hayek’s criticism of his 3-percent rule for growth in the stock of money. Hayek made the criticism in a 1975 lecture entitled, “Inflation, the Misdirection of Labour, and Unemployment,” which was published in a 52-page pamphlet called Full Employment at any Price? (of which I own a copy) along with Hayek’s Nobel Lecture and some additional Hayek had written about inflation and unemployment. I wish I could share the confidence of my friend Milton Friedman who thinks that one could deprive the monetary authorities, in order to prevent the abuse of their powers for political purposes, of all discretionary powers by prescribing the amount of money they may and should add to circulation in any one year. It seems to me that he regards this as practicable because he has become used for statistical purposes to draw a sharp distinction between what is to be regarded as money and what is not. This distinction does not exist in the real world. I believe that, to ensure the convertibility of all kinds of near-money into real money, which is necessary if we are to avoid severe liquidity crises or panics, the monetary authorities must be given some discretion. But I agree with Friedman that we will have to try and get back to a more or less automatic system for regulating the quantity of money in ordinary times. The necessity of “suspending” Sir Robert Peel’s Bank Act of 1844 three times within 25 years after it was passed ought to have taught us this once and for all. A polite, but stern, rebuke to Friedman. Friedman, not well disposed to being rebuked, even by his elders and betters, wrote back an outraged response to Hayek accusing him of condoning the discretionary behavior of central bankers, as if unaware that Hayek had already explained 15 years earlier in chapter 21 of The Constitution of Liberty why central bank discretion was not a violation of the rule of law. Somehow or other, Professor Taylor must have come across Friedman’s letter to Hayek, and thought that it would be edifying to mention it in his Hayek Prize lecture. Bad idea! So, hopefully, that was enough to get everybody back on track. Actually, this episode – I certainly, obviously, don’t mean to suggest, as some people might, that Hayek changed his message, which, of course, he was consistent on everywhere else. Well, this is embarrassing. Obviously not well-versed in Hayek’s writings, Taylor mistakes the Institute of Economic Affairs, Occasional Paper 45, Full Employment at any Price? for a book, while also overlooking the question mark in the title. That would be bad enough, but Taylor apparently infers that the title (without the question mark) represented Hayek’s position in the pamphlet, i.e., that Hayek was arguing that the chief goal of policy in the 1970s ought to be full employment, in other words, exactly the opposite of the position for which Hayek was arguing in the pamphlet that Taylor was misidentifying and in everything else Hayek ever wrote about inflation and unemployment policy. Hayek was trying to explain that the single-minded pursuit of full employment by monetary policy-makers, regardless of the consequences, would be self-defeating and self-destructive. But, ignorant of Hayek’s writings, Taylor could not figure out from reading Friedman’s letter that all Friedman was responding to was Hayek’s devastating criticism of Friedman’s 3-percent rule, a rule that Taylor, for some inexplicable reason, still seems to find attractive, even though just about everyone else realized long ago that it was at best unworkable, and, in the unfortunate event that it could be made to work, would be disastrous. As a result, Taylor thoughtlessly decided to show that even the great Hayek wasn’t totally consistent and needed the guidance of (the presumably even greater) Milton Friedman to keep him on the straight and narrow. And this from the winner of the Hayek Prize in his Hayek Prize Lecture, no less. Just by way of sequel, here is how well Hayek learned from Friedman to stay on the straight and narrow. In Denationalization of Money, published in 1976 and a revised edition in 1978, Hayek again commented (p. 81) on the Friedman 3-percent rule. As regards Professor Friedman’s proposal of a legal limit on the rate at which a monopolistic issuer of money was to be allowed to increase the quantity in circulation, I can only say that I would not like to see what would happen if it ever became known that the amount of cash in circulation was approaching the upper limit and that therefore a need for increased liquidity could not be met. To such a situation the classic account of Walter Bagehot . . . would apply: “In a sensitive state of the English money market the near approach to the legal limit of reserve would be a sure incentive to panic; if one-third were fixed by law, the moment the banks were close to one-third, alarm would begin and would run like magic. So much for Friedman getting Hayek back on track. The idea! In an op-ed piece in today’s Wall Street Journal, John Taylor, seeking to provide some philosophical heft for his shallow arguments for “rules-based fiscal, monetary, and regulatory policies” and his implausible claim that “unpredictable economic policy . . . is the main cause of persistent high unemployment and our feeble recovery from the recession,” invokes the considerable authority of F. A. Hayek. Taylor’s op-ed, based on his Hayek Prize Lecture to the Manhattan Institute on the occasion of receiving the Institute’s Hayek Prize for his new book First Principles: Five Keys to Restoring America’s Prosperity, shows little sign of careful reading of or serious thought about what Hayek had to say on the subject of rules. Perhaps I shouldn’t take it too personally, but I can’t help but observe that just about six months ago, I wrote a post entitled “John Taylor’s Obsession with Rules” in which I quoted liberally from Hayek’s writings on monetary policy, especially from Hayek’s Constitution of Liberty. My earlier post was prompted by a critique of NGDP targeting that Taylor posted on his blog in which he compared NGDP targeting unfavorably with Milton Friedman’s 3-per cent rule for growth in the money supply. Taylor criticized NGDP targeting, because, unlike the Friedman rule, it allowed the Fed to exercise discretion in achieving its target, evidently not grasping the obvious fact that the Fed has no more control over M2 than it does over NGDP. Well, I’m not sure what to make of Taylor’s invocation of Hayek in his op-ed. I guess if you are awarded the Hayek Prize, it’s only fitting to say something nice about the old sage, and at least feign some interest in what he had to say. But if Taylor did made a substantial investment in studying what Hayek wrote about following rules in the conduct of monetary policy, I see no evidence of it in his op-ed. Taylor also mentions the point that a rules-based monetary policy enhances the predictability of monetary policy, which presumably results in increased predictability of the economic environment in which economic agents make their decisions. Rules for monetary policy do not mean that the central bank does not change the instruments of policy (interest rates or the money supply) in response to events, or provide loans in the case of a bank run. Rather they mean that they take such actions in a predictable manner. There is one basic dilemma, which all central banks face, which makes it inevitable that their policy must involve much discretion. A central bank can exercise only an indirect and therefore limited control over all the circulating media. Its power is based chiefly on the threat of not supplying cash when it is needed. Yet at the same time it is considered to be its duty never to refuse to supply this case at a price when needed. It is this problem, rather than the general effects of policy on prices or the value of money, that necessarily preoccupies the central banker in his day-to-day actions. It is a task which makes it necessary for the central bank constantly to forestall or counteract development in the realm of credit, for which no simple rules can provide sufficient guidance. The same is nearly as true of the measures intended to affect prices and employment. They must be directed more at forestalling changes before they occur than at correcting them after they have occurred. If a central bank always waited until rule or mechanism forced it to take action, the resulting fluctuations would be much greater than they need be. . . . So my advice of six months ago, “Professor Taylor, forget Friedman, and study Hayek” is still good advice. I hope, but am not confident, that Professor Taylor will follow it. Was There a Blue Wave? I am an economist in the Washington DC area. My research and writing has been mostly on monetary economics and policy and the history of economics. In my book Free Banking and Monetary Reform, I argued for a non-Monetarist non-Keynesian approach to monetary policy, based on a theory of a competitive supply of money. Over the years, I have become increasingly impressed by the similarities between my approach and that of R. G. Hawtrey and hope to bring Hawtrey's unduly neglected contributions to the attention of a wider audience.